Congratulations to our client KindNotes for their feature on LivingBetter. 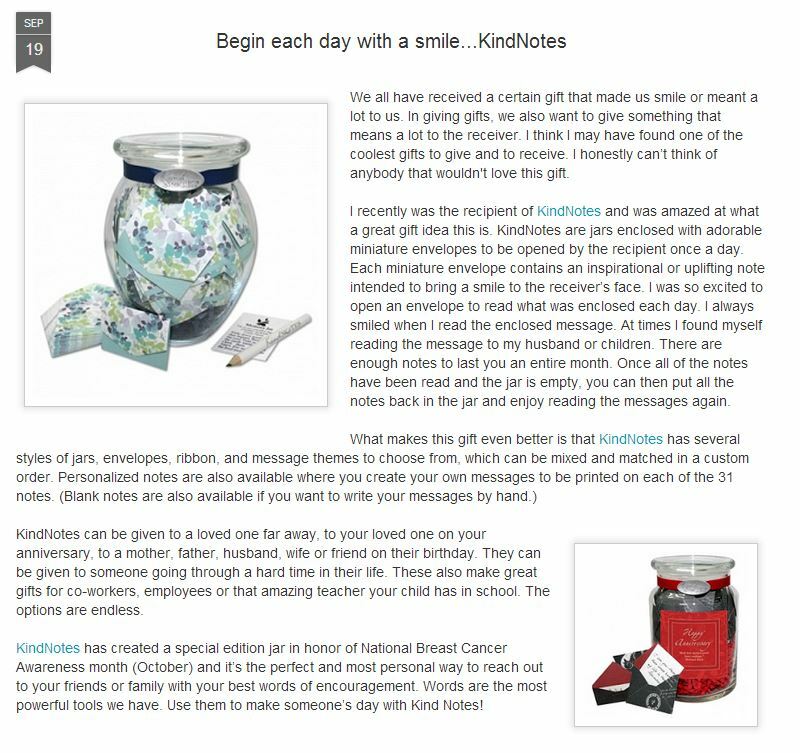 Each KindNotes starts with a beautiful decorative jar that is then filled with 31 linen cardstock envelopes, each carrying inside its own message of love, inspiration, friendship, and more. Instead of enjoying only one day filled with surprises, they can experience a whole month or more. KindNotes has an array of themes to suit any relationship or event such as gratitude, inspiration, get well, sympathy, long distance, love, friendship and more. The recipient can enjoy them in their own way as often as wanted. There are a number of pre-made jars available, or they can be completely tailored to a particular person using the online interactive wizard that allows them to re-customize again and again, and watch as their very own creation appears. This one-of-a-kind, innovative gift will bring back the warm sentiment of an old-fashioned letter that seems to have been forgotten in a world of emails and texts. Check them out at KindNotes.com.